Epazote, Chenopodium ambrosioides, is also known as Wormseed and Chandanbatva (Ayurvedic). The traditional Mexican folk use of Epazote leaf and seeds is as a remedy for intestinal parasites. The leaves are used as a spice and digestive aid in Mexican chilli sauces. Sprig of leaves added to beans when cooking said to render beans gas free. Leaves also used to flavour mushrooms, chicken and cheese. A strong infusion of the leaves is an effective spray for cockroaches. Note: All parts of the plant are at least slightly toxic. 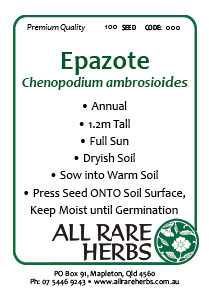 Epazote is native to central America and is adaptable to most soils and positions. Tolerates poor soils. Drought and frost resistant. Annual or perennial, depending on climate. Grows to 1.0m x 0.5m. Sown in early summer in sandy soil. Be the first to review “Epazote, seed” Click here to cancel reply.